COPS OUT OF BLACK, LATIN, POOR COMMUNITIES ACROSS THE U.S. Protesters against murders by cops block traffic on Woodward Avenue at Clairmount Sept. 24, 2016. They later released their balloons into the sky to remember their loved ones. Among others, they included Arnetta Grable, Mertilla Jones, and Kimberly Davis. Rev. Jerome McCorry of Dayton, Ohio, who led the street protest, shouts encouragement. Many drivers honked their horns in support, even getting out of their cars to see what was happening. 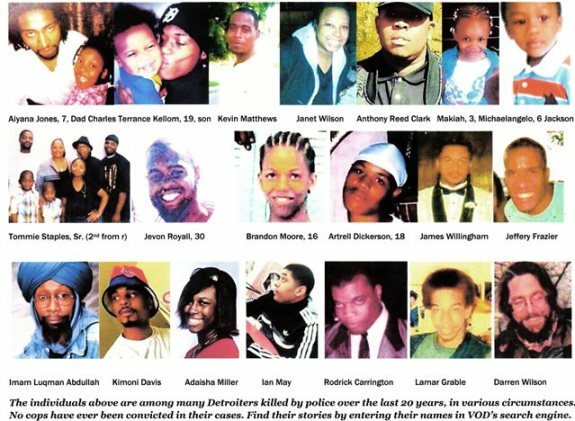 VOD: before and since this Sept. 24 action, held in Detroit, cops have continued their deadly rampage across the U.S. Three brutal executions of Black men happened in California alone within two days during the past week. 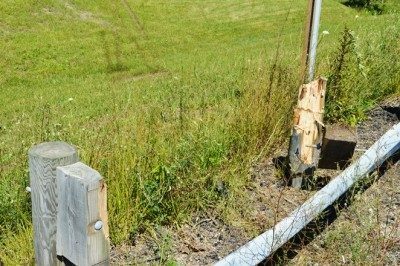 A man and two teens died in Taylor and Livonia, Michigan after police chases. Videos and links to those stories are below this one. Group gathers after blocking traffic. 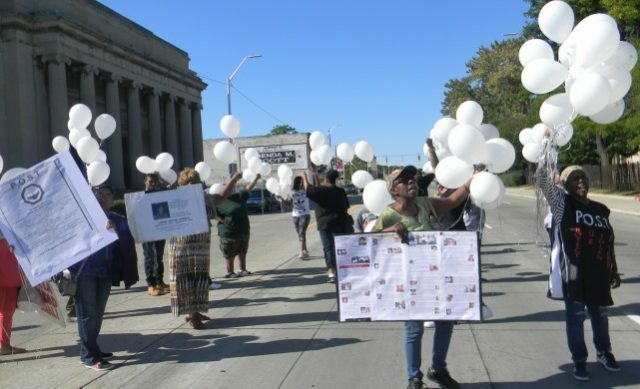 DETROIT – As the U.S. rises up against the genocidal slaughter of Blacks by police from Charlotte, S.C. to Columbus, Ohio, to Tulsa, Arizona, family members from Detroit, New York City, Dayton, Ohio, Kenosha, Illinois and elsewhere blocked Woodward Avenue for an hour Sept. 24 to demand justice for their loved ones’ deaths. 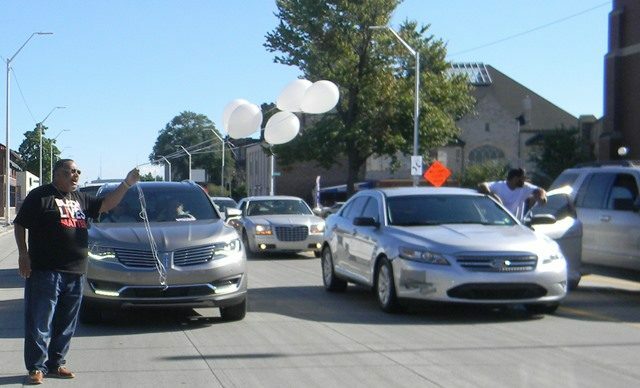 Drivers honked their horns in solidarity as the families chanted and released white balloons heavenward, with the names of Adaisha Miller, Terrance Kellom, Aiyana Jones, Lamar Grable, Kimoni “Kodak” Davis, Justus Howell, Malcolm Ferguson, John Collado and Emmet Till printed across them or displayed on t-shirts and signs. Balloons fly skyward in memory of those murdered by police. 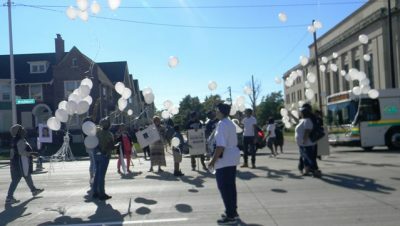 Pastor McCorry and P.O.S.T (Protect Our Stolen Treasures), headed by Yolanda McNair, based in Detroit, and members of the Original Detroit Coalition against Police Brutality led the militant action. They sponsored held a day-long conference at St. Matthew’s and St. Joseph’s Church on Woodward and Clairmount to solidify their ties with each other and reach out to others. At an afternoon panel, family members told heart-wrenching stories. 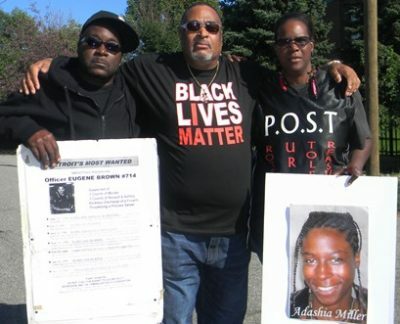 Kevin Kellom, Pastor Jerome McCorry, and Yolanda McNair, leader of P.O.S.T., holding poster with her daughter Adaisha Miller’s photo. 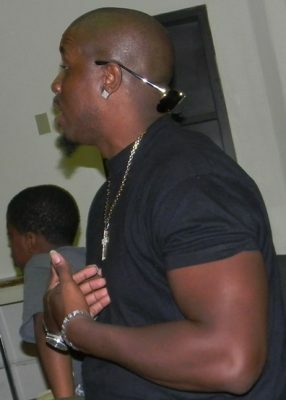 Parrish claimed his gun, which he was carrying in a side holster while he danced with Adaisha during a party involving drinking went off accidentally July 8, 2012. The Detroit police covered up for him, smearing Adaisha’s name. He was never charged, not even with reckless endangerment. He was not tested for alcohol or drugs. Arnetta Grable comforts Kevin Kellom as he speaks during panel. 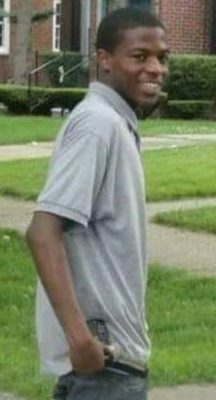 Kevin Kellom, who attended the event with his wife Yvette Johnson, remembered the Detroit and federal police execution of his son Kevin Kellom, 18, on April 27, 2015. 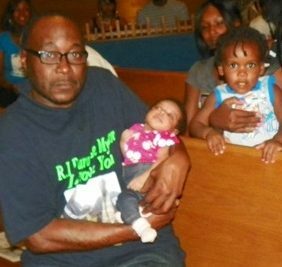 Kevin Kellom with grandbabies Terranae Kellom, Terrance Kellom. Police claimed Kellom threatened them with a hammer, but Wayne County Prosecutor Kym Worthy said during a press conference announcing that no charges against the cops would be brought, that no fingerprints were found on the hammer. 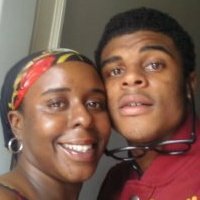 Kimberly Davis with son Kimoni “Kodak” Davis. FB page. Kimberly Davis, mother of Kimoni “Kodak” Davis, said he was killed during a car chase in a speed trap set up by Hanging Rock, Ohio police, who said he was going 11 miles over the speed limit as he was coming back home on an Ohio highway. His 17-year-old friend Airshawn Warren of W. Virginia also died. White Hanging Rock cop David Caruso, who had participated in four such other chases, drove the lead car. State Highway Patrol photographs of the freeway embankment Davis drove up on before flying over three lanes and crashing in a gulley show tracks from two sets of cars, indicating that police may have followed and pushed his car over the road. Two sets of tire tracks going up embankment where Davis car went airborne. The one on the left appears to be veering toward one on the right. OHP photo. Aaron Grable, brother of Lamar Grable, speaks at conference Sept. 24, 2016. As explained in the previous story on the 20th anniversary commemoration of Lamar’s death, the truth came out during a civil trial, “Lamar’s day in court,” that his mother fought seven years to bring about. It resulted in the U.S. Department of Justice intervention into the Detroit Police Department on consent decrees lasting over 10 years. 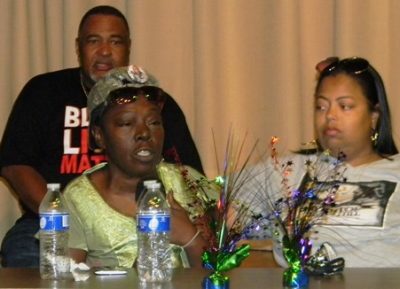 Mertilla Jones, grandmother of Aiyana Jones, 7 when she was viciously shot to death in the head with an AK-47 by Detroit cop Joseph Weekley, leading a military-style assault team on May 16, 2010, also spoke. Her family has gone through unspeakable harassment, frame-ups, and torture since they lost their beautiful little girl. Jones was sleeping on a living-room couch with her favorite grandchild when police broke in. They had no search warrant for the family’s home, only for an upper flat above their address. 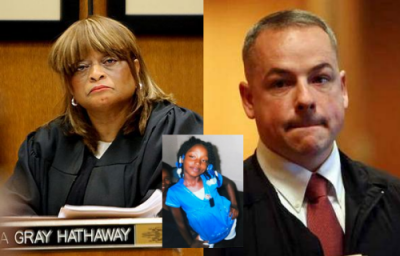 Detroit cop Joseph Weekley went free after several mistrials deliberately caused by Judge Cynthia Gray Hathaway in league with the prosecution and defense. He is now back on the force. His brother Nate Weekley was recently disciplined for posting on Facebook that Black Lives Matter is a terrorist group. 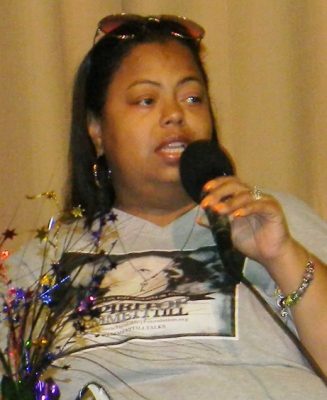 Mertilla Jones speaks Sept. 24, 2016 about DPD murder of her granddaughter Aiyana Jones, 7, on May 16, 2010. Latoya Howell, mother of Justus Howell, 17. News reports said Howell had been shot twice in the back by Kenosha police as he ran from them, in early April 2015. Protests followed. 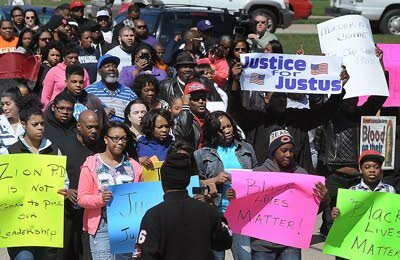 At one held in Zion, Ill. People carried signs declaring “Blood on their badges,” “Stand up 4 Justus,” “Black Power: Our children are the power,” “Hands up, don’t shoot,” and “Black Lives Matter,” according to the Kenosha News. 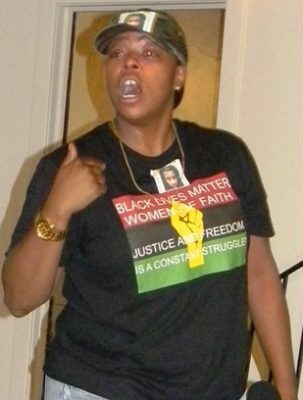 Ericka Gordon-Taylor, a cousin of Emmett Till, lynched in the South in 1955, attended the conference with her mother, both wearing T-Shirts commemorating the 14-year-old child and his mother Mamie Mobley, who insisted on an open casket funeral to show the world how vicious racists had savaged her child’s face and body. Ericka Gordon-Taylor remembers Emmett Till. They had just returned from the grand opening of the Smithsonian’s National Museum of African-American History, which featured the first display of that casket. Till was exhumed in 2005, and could not be re-buried in the same casket. Also in attendance were Joshua Lopez of New York City, whose uncle John Collado was murdered by an undercover cop in 2011 as he sought to break up what he thought was a neighborhood fight, but instead was the cop beating another man. Lopez has been very active since, traveling across the country to numerous rallies. 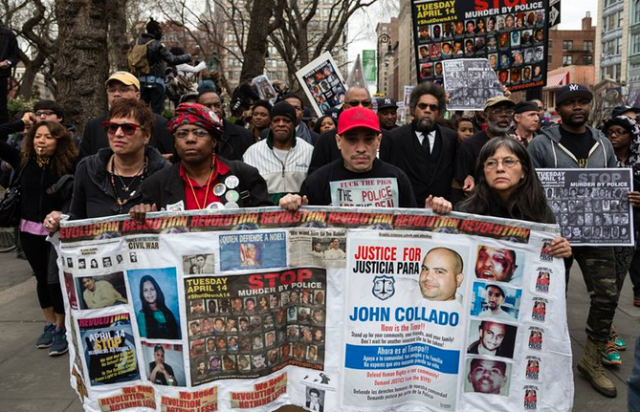 Joshua Lopez (center in red cap) during march for his uncle John Collado in NYC. He was joined by Juanita Young of New York City, whose son Malcolm Ferguson was shot and killed March 1, 2000 in the Bronx, by plainclothes officer Louis Rivera. Like the family of Lamar Grable, she fought in court for years and in June 2007 a jury awarded her $10.5 million for the killing of her son, which was later reduced on appeal. 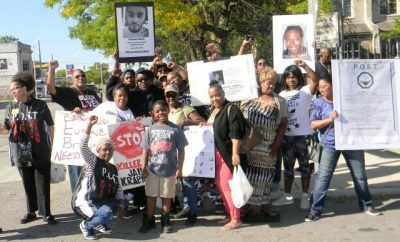 She and her family have been subjected to constant police raids and brutality since that time, like the family of Mertilla Jones. 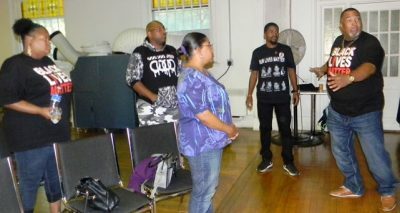 Young leads the organizing of national events like the one in Detroit Sept. 24. 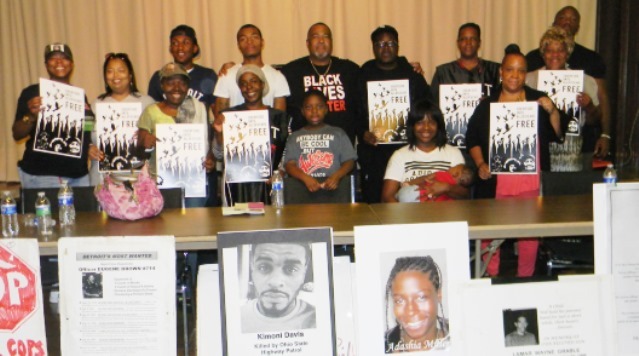 Members of Dayton, Ohio BLM group at conference. Pastor McCorry summed up the conference in tears, saying, “This is my family. I love everyone sitting at this table. I refuse to ever sell you out. Family members gather at end of conference. They had just been awarded posters declaring solidarity between African-Americans and the struggle of the Palestinian people. Videos and stories on recent killings by police across the U.S. and Michigan. FLAT ROCK, MI MAN ROBERT PARENT SHOT TO DEATH BY STATE TROOPERS AFTER CHASE SEPT. 3O.